For the past few months, Vanessa and I have been working on a relaunch of Real Housewives of Abu Dhabi. This included a new logo and a new website. Not an easy task on top of busy schedules. I don’t need to tell you how quickly a housewife’s day fills up leaving you asking yourself “Where did the time go?” Not only that – but before we started on the website, our technical skills consisted mainly of posting and liking pictures on Facebook. Oh, I should not forget to mention our triumphant use of twitter and instagram since last October (cue music “A Whole New World”). 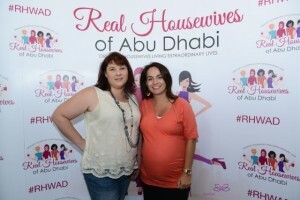 It has been an exciting beginning for us working on the Real Housewives of Abu Dhabi group. We wanted the logo to embrace the variety of women that live in UAE. We hope that the webpage captures the essence of life in Abu Dhabi but also a showcase of the talent that is right on our doorstep. The savvy women of Abu Dhabi have a lot of expertise and knowledge to share. The housewives that we have met come from all over different parts of the world, and are also moms, artists, business owners, chefs, photographers, writers, the list goes on and on. We aim to bring everyone together so that we can all benefit from each other’s company. This relaunch would not have been possible without two people who helped make our vision a reality. Firstly, there would be no website without the wonderful Amanda Lord. She has worked diligently with us setting up the website and teaching us how to do it on our own. From our initial meeting, she has worked patiently with us. She is our Trinity, our Penelope Garcia, our ‘go-to-gal’ for all things tech. Secondly, we LOVE our beautiful water-colour banner created by Maria Hegedus from UAE Murals. We gave her our idea and she took it and made it a better reality than what we hope for. Vanessa and I will be eternally grateful to these wonderful women who helped inspire, motivate and empower us. To celebrate, the Real Housewives of Abu Dhabi came out in full force to the Logo/Website unveiling at Impressions Lounge at Anantara Eastern Mangroves. This spacious venue overlooking the mangroves provided the perfect setting for making new friends and catching up with old ones. The ladies enjoyed their morning coffee with and a lovely spread of pastries and fruits. Adding some extra bling and style to the occasion was Jean from Desert Diamonds and Aideen from Colour Me Beautiful. The Housewives also enjoyed special hand massages courtesy of Nail Couch Spa. Overall it was an eventful morning. We look forward to sharing many more wonderful events with the ladies of Abu Dhabi. I love the new logo and the mural. Well done! Congratulations Vanessa! The NEW RHWAH logo and mural is very eye catching & fun. I look forward to the many more exciting events and coffee events in Abu Dhabi.